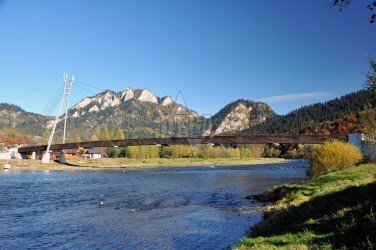 The village is situated on the right bank of the Dunajec River. The village arose after the settlements Nižné Šváby, Červený Klýštor and Smerdžonka joined together. unty. However, it also had quarrels with Czorsztyn lords, it was conquered by the followers of Ján Hus in 1431 and in 1433. In 1545 it was attacked by the armies from the Niedzica Castle and it was adversely hit by the battle on the Moháč field in 1515. It decayed successively and monks moved to Poland. The monastery was abolished during the Reformation in 1563 and it became a private property of many nobles (Thököly, Horváth from Plaveč, Rákóczi and others). Ladislav Maťašovský, a bishop in Nitra, bought it in 1699 and donated to the religion of Kamalduls, who settled down it this area in 1711. The rules of this religion were very strict. Monks lived isolated in their cells, kept taciturnity, were active in farming, gardening, fishery, alchemy, nursing and literature. Joseph II. decided to abolish the monastery by one of his decrees in 1782. Its interior was sold and transferred to various places (library went to Budapest, church equipment went to Muszyn in Poland, etc.) In 1820 the emperor donated the monastery to the just-founded Greek-Catholic bishop see in Prešov. After the World War II. it was nationalised and between the years 1956 and 1974 it was under construction. After the reform of Joseph II. monks refused to work on the royal farms. Therefore German settlements were invited to work on the farms in 1786 - 1788. Thus several villages arose in the Zamagurie region (Nižné Šváby for instance). Nižné Šváby (nowadays Red Monastery) were known already in the 16-th century. Local inhabitants were mostly farmers, shepherds and raftsmen. In the valley of the Lipník creek, 1 km far from the monastery, there you would find Red Monastery spa (in past “Smerdžonka”). The spa settlement arose at a spring of cold vitriol water in 1820. At the beginning of the 20-th century (after the hand-over by the Spiš county), it was in the centre of attention of the Spiš population. The spas was destroyed during the World War I. and reopened in 1928.